Please read the below for detailed answers to the most commonly asked questions about FSL 11+ Online. If your question isn’t answered in the FAQ, please email support@fsl-online.co.uk and someone will get back to you within 48 hours. What’s included in my FSL 11+ Online subscription? Your subscription includes everything that FSL 11+ Online has to offer. The platform includes two full 11+ courses (for Durham CEM or GL Assessment exams) consisting of hundreds of weekly downloadable worksheets, video tutorials and practice tests. Your subscription also includes access to an extra bank of exclusive 11+ worksheets in all subject areas, as well as our bank of extra online tests with automatic feedback. Finally, your subscription includes access to all future materials that we’ll be releasing in the coming months; most notably including mock exam papers and a summer revision course. Which 11+ course should my child complete? This is dependent on which county or region you’re based in, because different areas (and different schools, in some cases) use different exam boards for their 11+ exams. By far the most common exam boards are Durham CEM and GL Assessment, so it’s very likely that your child will be sitting one of these exams. There are lots of similarities between the two exam boards (you will have full access to both courses on your profile) but there are also some notable differences, so it’s important to know which one your child will be sitting. If you’re not sure which exam board is the right one for your child, head to the regional information pages on our website (under ‘The 11+ Exam’). We keep this information up-to-date as much as possible, but please be sure to also check the school admissions section of your local county council’s website to know for sure. What subjects are covered by FSL 11+ Online? 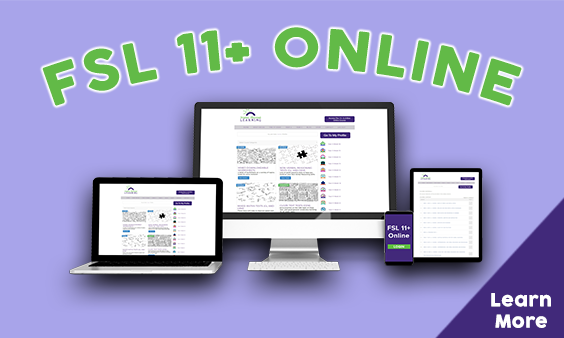 FSL 11+ Online covers all of the most common subjects and topics that are typically included in the 11+ exam in different regions, including: English, Verbal Reasoning (both GL Assessment and Durham CEM types), Maths, Non-Verbal Reasoning and Spatial Reasoning. When is the best time for my child to start FSL 11+ Online? Your child can start FSL 11+ Online whenever is most convenient for them, but we tend to recommend either September or January of Year 5, depending how quickly they want to work through the course. If you just want to join for a few weeks closer to the exam, however, this is also fine and there are many materials on the platform to support this. How can I tell how well my child is progressing with FSL 11+ Online? All weekly worksheets and materials come with full answers and guidance notes, so parents will be able to keep track of how well their child has understood each individual topic. All topics also come with an end-of-week practice test, in which your child should be aiming for a score of 80% or more to show how well they have understood a given topic. All online tests are marked automatically and instant feedback is provided and sent to your email, so you will also be able to get a good indication of your child’s progress through these tests. What new materials can I expect from FSL 11+ Online in the coming months? We’ll be adding a selection of new worksheets and online practice tests in all subject areas to the FSL platform every month starting from September 2018. In spring 2019 we will also be introducing full mock exam papers and a five-week summer revision course for both Durham CEM and GL Assessment exam types. Will you be offering 11+ mock exams? We will be releasing full mock exam papers geared towards both Durham CEM and GL Assessment exam boards by spring 2019. These will be available to download from your profile and will be included in your usual £14.95 per month subscription. We will also be offering limited face-to-face mock exam sessions around Buckinghamshire and Hertfordshire through Fraser Stevens Learning. These will be subject to an extra charge and will be external to FSL 11+ Online. Please email hello@fraserstevenslearning.com for more information about mock exam sessions during summer 2019. Is FSL 11+ Online useful for exams other than the 11+? Absolutely! Our courses and materials also provide key preparation for a range of common entrance exams and Year 6 SATs. Many students also use our materials for a simple boost in their maths, English and reasoning skills in Year 5. How much does FSL 11+ Online cost? FSL 11+ Online costs £14.95 per month, and you can cancel your subscription at any time. You can cancel your subscription easily through your FSL 11+ Online account. Simply log on to your profile page and scroll down the right of the page until you see ‘Manage My Account’. Click that and you’ll see an option to unsubscribe immediately. I have more than one child; do I need more than one subscription? Not necessarily, because the worksheets and video tutorials can be downloaded as many times as required, but we do recommend that each child has their own profile so that they can make full use of the online tests and keep track of their individual scores/progress. Please email support@fsl-online.co.uk if you have twins or triplets, and we will be happy to offer a discount for any extra subscriptions. I’m a tutor; can I use FSL 11+ Online for my students? Please note that we are happy for tutors to download and print our free resources (not part of FSL 11+ Online) for their students without restriction. What if I have any questions while my child is working through FSL 11+ Online? If at any point you or your child have a question that isn’t answered in this FAQ section, please send an email to support@fsl-online.co.uk. We will always aim to get back to enquiries within 48 hours.